St Kilda is an inner suburb (neighbourhood) of the metropolitan area of Melbourne, Victoria, Australia, 6 km south-east of Melbourne's Central Business District. Explore hidden gems such as Wilson Botanic Park and Cheap AZ Travel. 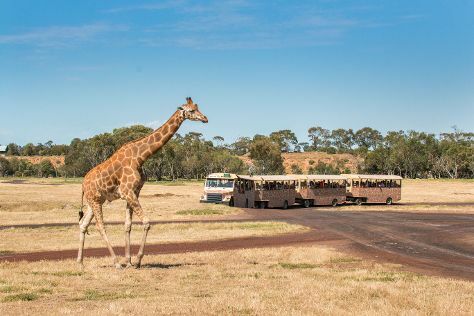 Kids will appreciate attractions like Werribee Open Range Zoo and Brighton Beach. You'll find plenty of places to visit near St Kilda: Adrenaline & Extreme Tours (in Werribee) and Lysterfield Park (in Narre Warren). The adventure continues: kick back and relax at St. Kilda Beach, admire the natural beauty at Veg Out Community Gardens St Kilda, don't miss a visit to Brighton Bathing Boxes, and stroll around Windsor Siding. To find reviews, where to stay, maps, and other tourist information, read St Kilda road trip planning website . Singapore, Singapore to St Kilda is an approximately 11-hour flight. You can also do a combination of flight and shuttle. The time zone difference moving from Singapore Time (SGT) to Australian Eastern Standard Time (Victoria) (AEST) is 2 hours. Traveling from Singapore in May, expect St Kilda to be colder, temps between 20°C and 10°C. On the 2nd (Sun), wrap the sightseeing up by early afternoon so you can travel back home.